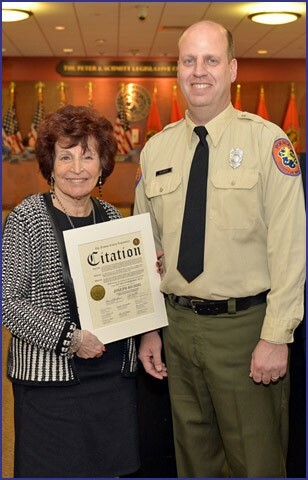 Nassau County Presiding Officer Norma Gonsalves had the honor of recognizing Nassau County Police Ambulance Medical Technician Joseph Biundo at a recent meeting of the Nassau County Legislature. The quick thinking and resourcefulness of Biundo potentially saved many lives at a Dunkin’ Donuts in Carle Place last summer. Biundo, who has been working as an AMT for 15 years, bought a portable carbon monoxide detector that he wears on his belt while on duty. One day, while inside the Dunkin’ Donuts, his detector indicated deadly levels of carbon monoxide in the air. Biundo investigated further and discovered the levels of the gas were near fatal in the kitchen. He evacuated the store and relayed the message to the Carle Place Fire Department. Officials later discovered a leaky oven pipe was the source of the problem. Pictured are Mr. Biundo and Presiding Officer Gonsalves.